332 pages | 1 B/W Illus. Yvette Taylor is Head of the Weeks Centre for Social and Policy Research at London South Bank University, UK. She received the esteemed Lillian Robinson Fellowship held at Concordia University, Canada (2009) and a Fulbright Scholarship, Rutgers University (2010-2011). She has published three sole-authored books: Working-class Lesbian Life (2007), Lesbian and Gay Parenting (2009), and Fitting Into Place? Class and Gender Geographies and Temporalities (2012), which have received favourable reviews. She has several successful edited collections including: (with Hines, S. and Casey, M.) Theorising Intersectionality and Sexuality (2010); Classed Intersections: Spaces, Selves, Knowledges (2010); (with Hines, S) Sexualities: Reflection and Futures (2012). 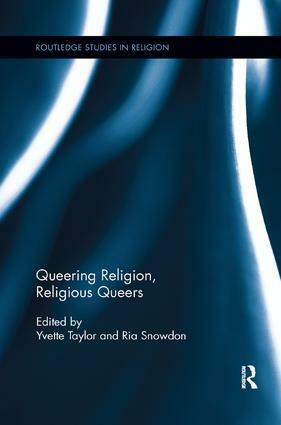 Ria Snowdon is a Research Associate in the Weeks Centre for Social and Policy Research at London South Bank University, UK working alongside Yvette Taylor on an ESRC funded project 'Making space for queer identifying religious youth'. She completed her Arts and Humanities Research Council (AHRC) PhD at Newcastle University (2007-2010).